For centuries, gardeners have attempted to breed blue roses with no success. But now, thanks to modern biotechnology, the elusive blue rose may finally be attainable. 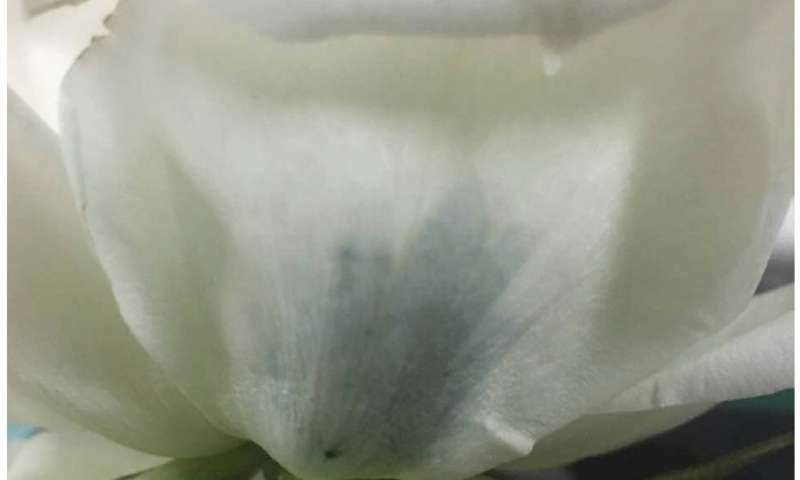 Researchers have found a way to express pigment-producing enzymes from bacteria in the petals of a white rose, tinting the flowers blue. They report their results in ACS Synthetic Biology. Although blue roses do not exist in nature, florists can produce blue-hued flowers by placing cut roses in dye. Also, in a painstaking 20-year effort, biotechnologists made a "blue rose" through a combination of genetic engineering and selective breeding. However, the rose is more mauve-colored than blue. Yihua Chen, Yan Zhang and colleagues wanted to develop a simple process that could produce a true-blue rose. For this purpose, the researchers chose two bacterial enzymes that together can convert L-glutamine, a common constituent of rose petals, into the blue pigment indigoidine. The team engineered a strain of Agrobacterium tumefaciens that contains the two pigment-producing genes, which originate from a different species of bacteria. A. tumefaciens is often used in plant biotechnology because the bacteria readily inserts foreign DNA into plant genomes. When the researchers injected the engineered bacteria into a white rose petal, the bacteria transferred the pigment-producing genes to the rose genome, and a blue color spread from the injection site. Although the color is short-lived and spotty, the team states that the rose produced in this study is the world's first engineered blue rose. They say that the next step is to engineer roses that produce the two enzymes themselves, without the need for injections. Is the blood supply distinctive or collateral per organ? Tissue Engineering processes walk through?